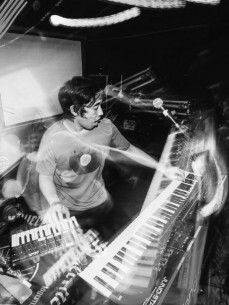 The Shanghai Restoration Project is often described as a group that creates high-energy electronic music rooted in modern day Chinese culture. The group’s music has reached the Top 10 electronic charts on iTunes and Amazon and can be heard daily on radio programs around the world. Live performances synchronize music with projected animations created by some of China’s most innovative visual artists. Dave Liang (DJ, keyboards) is the Emmy winning creator and producer of The Shanghai Restoration Project. He was born in Lawrence, Kansas and grew up in upstate New York. In addition to his production work for artists on his own label Undercover Culture Music, Liang has also worked with artists on Bad Boy, Warner, and Universal. Sun Yunfan (visuals) is a multidisciplinary artist whose work ranges from film and animation to painting, drawing, collage, sculpture, and artist books. Born and raised in China, her work has been featured in The New York Times, Rolling Stone, the Toronto International Film Festival, and museums and galleries in the US, Europe, and China.